Ridge Tool Company has developed and maintains a customer facing website that features all RIDGID products and other relevant information. We are focused on ensuring that RIDGID products and services are well-positioned and easily accessible via the internet to help support our distribution partners in the marketing and sales of RIDGID products. In order to help promote and direct end-users to distribution partners who can provide the exceptional online experience customers have come to expect, we have developed a Preferred Online Distributor Policy in order to achieve that experience. This policy explains the requirements for Distributors who qualify as a Preferred Online Distributor. Ridge Tool Company will determine, at its sole discretion, if a distributor’s website meets any and all requirements and reserves the right to alter the eCommerce Policy or remove any distributor’s links from Ridge Tool Company’s website at any time. Prominently display ownership of website with distributor name and/or logo and make clear that it is separate from any RIDGID logos or trademarks. Provide monthly point-of-sale data of all online RIDGID product sales, consisting of the RIDGID catalog number, quantity, and ship-to postal code. Use a stylized RIDGID logo towards the top of the required landing page. The page must be easily identified as a page dedicated to RIDGID products. Click on this link to see the acceptable logo versions. 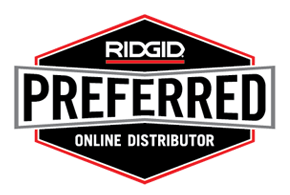 Distributors who make significant investments in the RIDGID product line, as well as their own website, can qualify to become a Preferred Online Distributor. Ridge Tool Company will promote these distribution partners by prominently displaying the Preferred Online Distributor marketing logo on RIDGID.com product pages. Ridge Tool Company will also have a webpage dedicated to Preferred Online Distributors with a direct link to the RIDGID landing page on the distributor’s website.